What is happening to Evening Grosbeaks? Evening Grosbeak feeding on box elder seeds. In the summer of 1981, when my husband and I moved into our house in Duluth, Minnesota, Evening Grosbeaks instantly became woven into the fabric of my daily life. They were the first birds I heard calling in the trees as we lugged boxes and furniture into the house, and the first birds to visit our bird feeders—even before the first chickadees showed up. Day after day throughout the following decade, Evening Grosbeak calls provided a lively and cheerful background soundtrack for our lives, indoors and out. Their numbers dropped in summer, rose in winter, and were huge during spring and fall migrations, but season after season, year after year throughout the 80s, Evening Grosbeaks were virtually always present in my yard. I had better luck with them than many people because my box elder trees attracted flocks flying overhead, but just about anyone in Duluth with platform feeders offering sunflower seeds had Evening Grosbeaks at least sometimes. 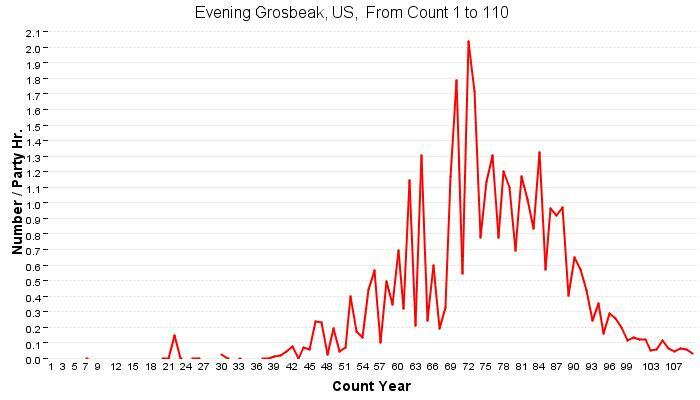 By the early 90s, grosbeak numbers seemed to be declining. I grew concerned, even mentioning my apprehensiveness in my first book in 1993. I thought it was part of a disturbing pattern in Duluth—during this same period, my neighborhood lost a lot of nesting birds, and the huge waves of migrating warblers and thrushes in my backyard dwindled. Friends of mine who lived in Duluth for several decades before I did also noticed the disappearance of many local nesting species—birds which have not returned. 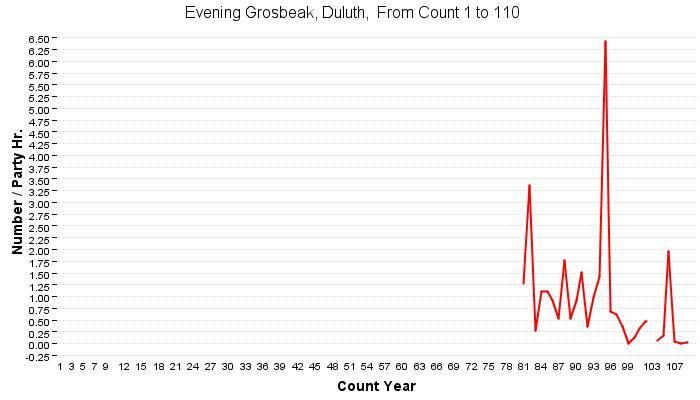 Duluth's Christmas Bird Count data was tricky to analyze because the count circle changed in 1979, so the pre-1979 count historical dataset is separate from that post-1979, and the graphs of the datasets are on different scales. 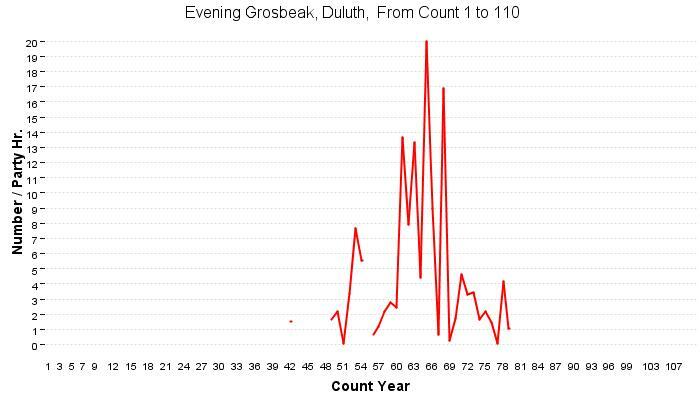 Pre-1979, the highest average Duluth count was 20 EVGR per party hour. The highest average number of EVGR per party hour post-1979 was slightly less than 6.5—a third less than in the earlier period. So the following graph is on a different scale than the previous one. 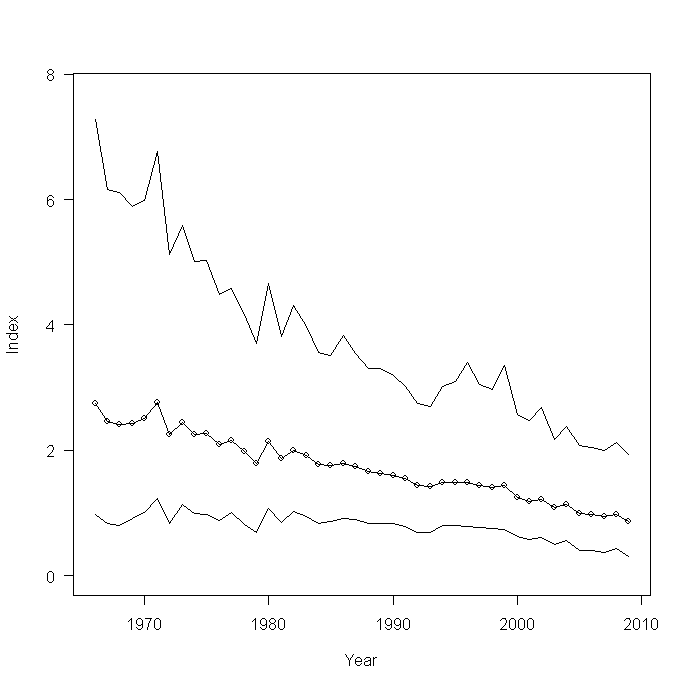 The smaller per-party average is almost certainly an artifact of the increasing numbers of CBC parties during the 70s and 80s. 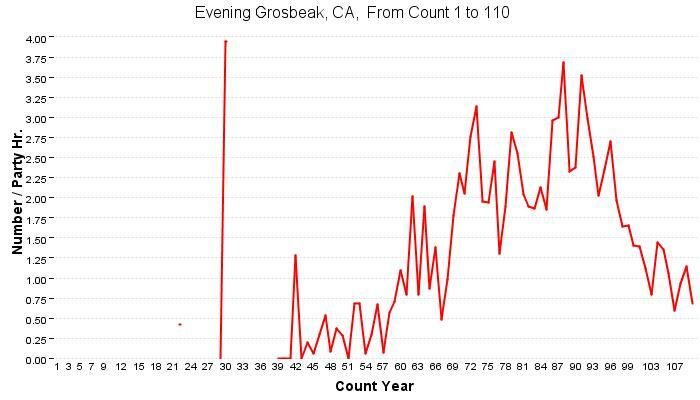 Evening Grosbeak flocks can be localized within a city, but when fewer parties participated, they would naturally have headed to the best feeders, so the number of grosbeaks counted wouldn't increase nearly as significantly as the number of parties did. Evening Grosbeaks were counted on every single Duluth CBC from 1979 until 2002, when not one was found. There were a handful in subsequent years, but 2011/12 has now been the third year in a row that they weren’t found at all on Duluth’s Christmas Bird Count. Why the rise in the middle, and why the drop? 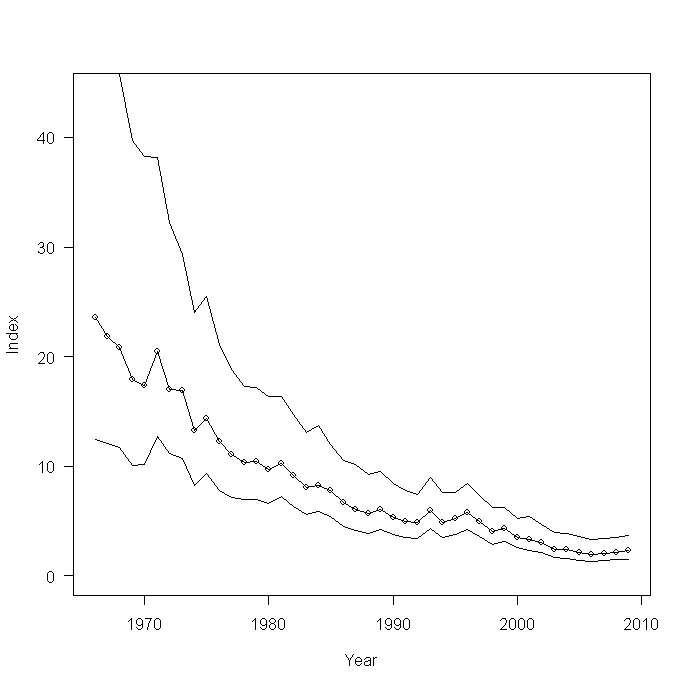 Did the population really increase in the 60s, or was the increase an artifact of the increasing numbers of birders and count circles in the northern third of the state during the 60s? It's impossible to know. 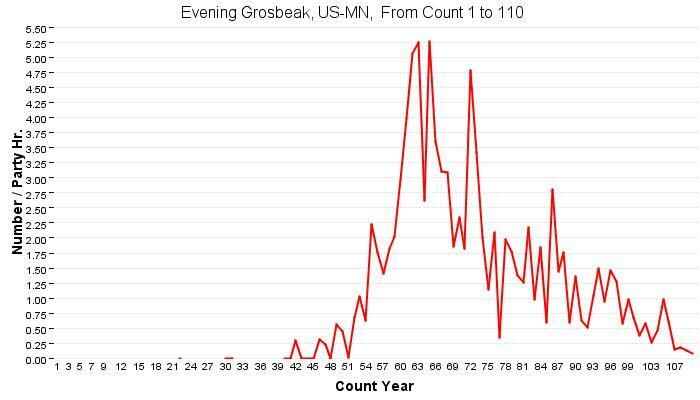 I've talked to people in their 80s and 90s who grew up in Duluth and remember lots of grosbeaks throughout their childhoods. That's anecdotal, though it may be significant in light of the absence of better data. But the rise and fall could also be due to the decades-long but irregular cycles of spruce budworm populations, a major component of the diet fed to nestlings. All we know for certain is that the decrease since the 80s is real, and has been found throughout both the United States (first graph) and Canada (second graph). These Christmas Bird Count graphs show an intriguing biennial rhythm, probably due to the cyclical nature of the seeds grosbeaks feed on. Evening Grosbeaks were not known in the Eastern states until the late 1800s; their sudden appearance there may have been due to ornamental tree plantings (box elder wasn't native to the East), the increase in popularity of bird feeding, or unknown factors. Evening Grosbeaks feed their nestlings insects, including (possibly preferentially in some places) spruce budworm. Controlling spruce budworm has been an important forestry goal for many decades, with heavy use of pesticides over enormous swaths of northern forest. One of the pesticides currently used is Bacillus thuringiensis, which isn't known to harm birds, but regardless of the pesticide used, the loss of larval insects during the nesting season may well be implicated. 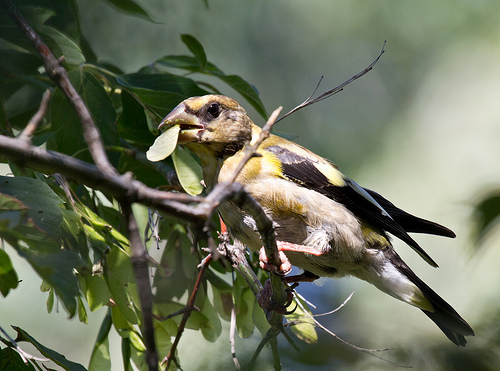 Adult and young Evening Grosbeaks feed heavily on maple and, especially, box elder seeds. In recent decades, forest management in huge swaths of northern forests has focused on fast-growing softwood trees for paper and wood products rather than on slower-growing hardwoods such as maple and box elder. This may have reduced another important food source. Exploitation of "tar sands" has also been implicated in the loss of huge swaths of Canadian forest habitat. Evening Grosbeaks are killed in much larger than average numbers at windows. Klem in 1989 listed them as the tenth-most frequently reported species killed by collision with building windows. What can we do individually and collectively to protect Evening Grosbeaks? Reducing our use of paper, purchasing recycled paper whenever possible, and recycling rather than discarding paper reduces our personal complicity with the forestry practices most harmful to Evening Grosbeaks. Conserving energy reduces our personal complicity with fossil-fuel extraction that destroys habitat. Encouraging and supporting research about Evening Grosbeaks, including filling gaps in life history information, will shed more light on what the species' needs are and what may have caused its decline. Knowing whether the drop in numbers is part of a natural cycle, a simple population blip, or a grave conservation issue will be a critical first step if action is to be taken under state or federal endangered species regulations. Membership and contributions to state and regional birding and ornithological societies and to research and conservation organizations (such as the American Bird Conservancy, the Cornell Lab of Ornithology, and Audubon) can help make a difference. If you've kept records of numbers and locations over the years, going back through your notes on Evening Grosbeaks and posting the information on eBird will provide valuable data. If you have older birding friends who kept a detailed field notebook during earlier decades, ask them to allow you to post their data on eBird. By the late 90s, Evening Grosbeaks completely disappeared from my Duluth yard. On a handful of occasions since then, I've had one or, at most, two birds visit for a few minutes and move on, and never more than a single visit per year. Then, this past August, for the first time since the mid-90s, an actual flock of grosbeaks, 16 birds including adult pairs feeding fledglings, showed up and were present every day for six weeks. Much of the time they fed on seeds or loafed in my box elders, but part of the time they visited my feeders and bird bath. I woke to their calls every morning and could hear their comfortable chattering throughout each day. They vanished in mid-September, and I haven't had one in my yard since. But hope is the thing with feathers that perches in the soul; even as I do my best to follow my own conservation advice, I'll keep hope alive that this splendid bird's disappearance is just a temporary blip.